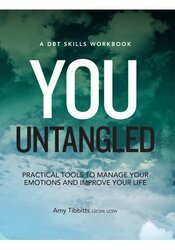 If you have been diagnosed with Borderline Personality Disorder (or BPD), experience emotional suffering or simply have difficulty managing your emotions, You Untangled can help. Using the principles of Dialectical Behavioral Therapy, this workbook offers proven methods to help free you from the tangled circumstances often brought on by chaotic thinking and behavior. With the compassionate guidance and practical skills presented in this workbook, you can conscientiously create a path toward the healthy, happy and fulfilling future you’ve always desired. Amy Tibbitts, LSCSW, LCSW, has been providing Dialectical Behavioral Therapy (DBT) in private practice for more than 15 years. She is the founder of the Lilac Center, a premier provider of DBT services in the greater Kansas City area. Her approach to therapy is based on a core of compassion, strength and sensitivity.